I just completed my first year of graduate school at the University of Michigan, and my first year teaching a first year composition course. I created this comic book as a way to explore and share the experience of creating my first digital composition unit for my students. I hope that it is valuable to instructors who find themselves considering undertaking a similar project, but (like me) lack the technological skills or pedagogical understanding. It’s for those who (also like me) are just a bit suspicious of introducing text-less compositions into the writing classroom. Link: Multimodal-Me by Molly Parsons. It allowed me to type on the board what once would’ve been written in my strange, slanted left-hander’s scrawl; type was much easier for my students to read. Added bonus: less chalk dust, fewer Expo-marked encrusted finger nails. I sent e-mails instead of shouting down the halls or walking miles around campus in search of someone or something. It let me show clips of video during class without having to stand on a chair to reach the TV and DVD player that was mounted five feet above my head. But beyond these tool-ish affordances, I felt uneasy about how technology was sneaking into my classroom. The teacher-lunchroom talk often ran the way of, ‘Kids these days…with their text-message language…If I get one more essay that has a smiley face emoticon…” (bluster, bluster, bluster). I saw some teachers take up technology as an essay-grading tool. And though I don’t think computers can grade, I knew why there was such happy excitement about this possibility—when you have 150-180 students it just isn’t possible to grade (writing) and plan for class and be a happy, well-balanced person. I saw other teachers take their students to the lab (reserving it for weeks at a time!) only to have them type essays on Word that, in the good ol’ days, would’ve been written in those little blue test books or in a spiral notebook. Technology seemed helpful sometimes but necessary only occasionally. What can I say using digital technologies that I can’t say with conventional pen-to-paper or even fingers-to-keyboard technologies? If we do need to teach students to make movies or write blogs or tweets or… How will those things change the way that students write and read? What, if anything, can they add to an English curriculum? I wanted my audience to have the chance to ask the questions with me, to partake in my process of discovery. I think that I was successful, kind of. But in order to make this sort of project communicate with the force and depth of writing, I now know that I need to learn a LOT more about the genre—and the software (I used ComicLife to compose the book). This is all to say that even though my intent was to create a stand-alone project, I find myself sitting at my computer and writing this blog post to explain it. And I am not alone here—even in the most multimediated of journals—Kairos, The Scholar Electric, Harlot of the Arts—text reigns. The videos, the comic books, the interactive interfaces are most often supplements to a word-made message. I included screen shots of Garret, Landrum-Geyer, and Palmeri’s “Re-inventing Invention” and of Sorapure’s “Between Modes: Assessing Student New Media Compositions” in my comic book. I would recommend these pieces to anyone planning a new media composition unit with their students. I also relied on Garret et. al’s piece—I used this text with my students to help them think about ‘juxtaposition’ as a concept and as a tool. We spent a day thinking about juxtaposing as a method of ‘inventing’ (as Garret et. al do), but then we continued to work with the term as the students were making choices about combining materials in the drafting state of composition. We asked: How can I create meaning without written or typed words, but rather by purposefully juxtaposing image with sound, video with still image, etc. Next time I teach this assignment—and I think that I will…–I will introduce this concept much earlier in the term, when there is still lots of writing left to be done. Because writing is all about purposeful juxtaposition—but it’s a heck-of-a lot easier to see how juxtaposition works in bright, flashy, multimedia. In fact, if this project wasn’t so time consuming (I needed 5 weeks to pull it off), I might make it the first or second thing my students did in the semester…In the current iteration of my syllabus, the video composition unit felt a little bit like a retrofit. All things I will continue to think about. Have I answered my questions? Kind of. I know better why my colleagues advocate for the inclusion of new media composing projects in the classroom. There is a great deal of overlap in process, technique, and even products, of all sorts of composition modes. And now I can have that discussion with my students—I know that, ultimately, the answers lie with them. I am a mother. And a daughter. And a graduate student enrolled in Dr. Melanie Yergeau’s Computers and Writing course. Our class recently spent a week discussing some of the more complex intricacies of copyright, and among our readings was Danielle DeVoss’s “Mothers and Daughters of Digital Invention,” in which she posits that one possible reason for the noticeable absence of women in the historical record of technology innovation is that many may have “deliberately avoided the regime of intellectual property.” While acknowledging Autumn Stanley’s argument that perhaps women are socialized to share rather than profit from their innovations, she argues that some women must have known about their IP rights and chosen to resist pursuing them. As a mother and a daughter (and a graduate student), I’m interested in this hypothesis. My own experience with fan culture supports DeVoss’s idea: many of the women I know write, vid, knit, sew, bake (and more!) for reasons that stand outside the monetary economy. DeVoss presents two examples of women battling the IP regime. Both involve content on Youtube that was met with DMCA intervention. What’s interesting to me here is that in both instances, women were making videos (for personal and educational reasons) with copyrighted content. This kind of IP resistance strikes me as a little different from, say, deciding to post your own artwork or story under a Creative Commons share-alike license. But maybe it isn’t. They used materials at hand in the course of their teaching and parenting, and their experiences became material for DeVoss’s scholarship. When I think about the literacies that my mother and grandmother engaged in, such as inventing bedtime stories or games, sewing dress-up costumes or knitting, creating, copying, and improvising recipes, keeping records for family trees and scrapbooks, writing invitations, thank-yous, and yearly Christmas card updates, I don’t see many opportunities for the intervention of IP. My mother and grandmother practiced these literacies of necessity, and they drew on the resources available to meet their needs. If they had been required to pay ninety-nine cents to license every copy of a recipe they shared, well… they just wouldn’t have. Paid, that is. A good recipe is meant to be shared. 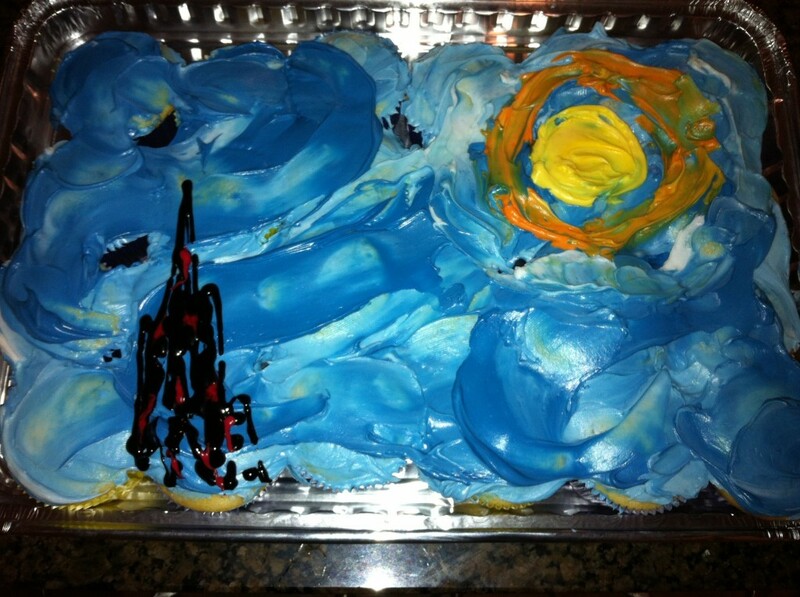 Public domain would allow me to make “Starry Night” cupcakes for the 6th grade “Starry Night” dance. 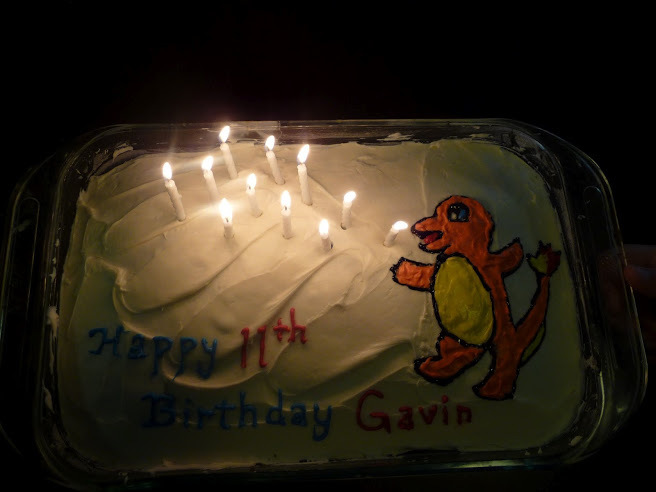 Would private interests object to the Pokemon cake made for my son’s 11th birthday? 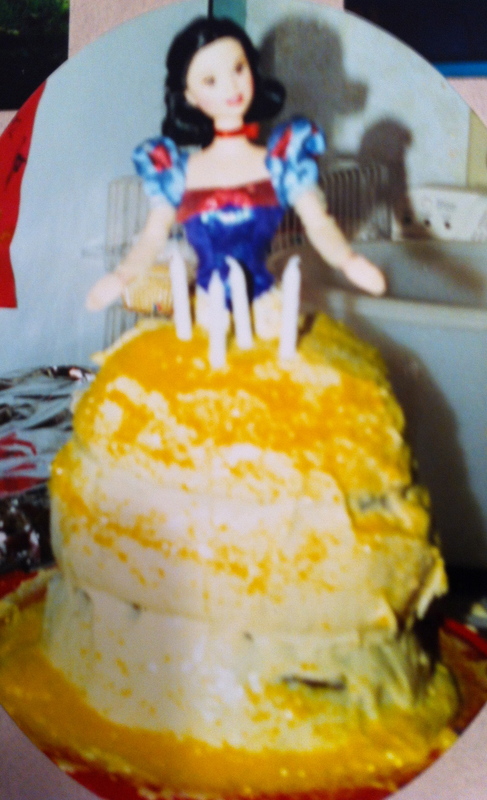 And what about a Snow White cake made for my daughter’s 4th? Is it the public domain fairy tale or the Disney princess? Half and half? Before we ate it, how much did this cake owe to the Brothers Grimm? How much to Disney? How much to Mattel? How much to Pampered Chef (who made the bowl in which the cake was made)? How much to the anonymous woman who posted a picture of her Barbie cake? How much to me? What was left to consume once it was properly apportioned? Cakes are perhaps not the best example. Being amateur renditions and quickly consumed, they don’t offer much threat (artistic or commercial) to the IP they are appropriating. Or maybe theyare the best example, being hand-made for a specific purpose, drawing on the cultural moment of the very local community they serve, intended for sharing, and (at least in this case) made by a woman. If I hadn’t posted the pictures here, you wouldn’t even know that I had made derivative works. Of course the same could be said of any movie-inspired Halloween costume, knitting project, remix vid, missing scene or alternate ending composed in response to copyrighted material. What the code has not caught up to is our expanded ability to share, and I think people who’ve learned the habit of this kind of creative work are going to continue to press copyright until it adjusts. For time out of mind, people have made things (for both artistic and utilitarian reasons) out of the materials around them, and the materials around us right now are often text, audio, images, and video that are available on the web. We don’t print pictures or mail cards so much anymore. We post them online instead. Deciding what, where, and when we post makes us curators of our own experience. We compose our online selves in text, image, and video. We compose our online selves out of experiences with other people, places, and texts, out of in-person and online interactions. We routinely invent and deliver using resources available online. This work isn’t new, but the question of who owns the resources of composition seems a little trickier. In a system that makes “sharing” the entry point, that encourages us to “post” our pictures, videos, and writing, even the language around what used to be somewhat private literacies has changed. (I never posted my high school diary entries, and I only share my scrapbooks with people who are willing to come over to my house and sit through them.) The former habit of privacy precluded any obvious need for copyright. The number of people who benefitted from comical pictures of my cat was limited to those who encountered me personally while I had the picture with me and thought to share it. Now that I could share the picture with an audience of unimaginable size, that picture (or recipe, pattern, blog post, film review, etc.) has the potential to be taken in and taken up and transformed by whoever accesses it. I have neither the resources nor the inclination to police it. Maybe the women in DeVoss’s webtext are pushing those who have the resources to give up the inclination. I doubt very much that those who own the rights to audio, images, video, and text will give up their grip on intellectual property and depend on the goodwill of fans to support them (though some are trying to). And of course all of these platforms prompting us to “share” our every life-moment, our every dark secret, are appropriating our work and collecting info to improve their ability to advertise, to capitalize on our dreams and desires. Don’t despair just yet, though! I think DeVoss is correct to press on Stanley’s notion that women are simply “socialized to share,” as if sharing were a shame. People are a social lot, and our most powerful stories may manage to survive in spite of poorly administered copyright protection that seems designed to keep them pristine, unevolved, unadapted to circumstances changing at the speed of technology. There have always been parallel and overlapping systems of barter and exchange, and there’s no reason to think that the internet will not have its own ways of getting around the constraints of a property-driven society. Mothers and daughters (and fathers and sons) will keep trespassing, keep making, keep testing the boundaries and sharing their results. Like we’ve always done in person, we are constantly making and remade on the internet. I am a first year MFA student in Dance Composition at the University of Michigan, Ann Arbor, and this past March I attended the American College Dance Festival Association’s (ACDFA) 40th anniversary conference, which was held at the University of North Carolina at Greensboro. Four first year graduate students accompanied ten sophomore, junior and senior BFA students to this four-day conference. ACDFA is a way for colleges and universities from around the country to come together to take class, present dance work in both formal and informal showings, and generally see what everyone else is up to. As a graduate student, I was not only taking class, but teaching as well. I was also asked to sit on a panel of faculty members to watch one of the informal concerts, and provide verbal feedback to the student and faculty choreographers who presented work. I enrolled in Melanie Yergeau’s Computers & Writing course (along with an MFA poet and PhD students from the Joint Program in English and Education) because my thesis work explores composition for both stage and online/onscreen. This class has given me the opportunity to discuss creation and composition with people who are outside of my genre, but it has taken me by surprise that my colleague’s main concern about including multimodal/digital composition in their classroom is how to assess and give feedback on a creative project. For dancers, it is common practice to both give and receive peer-to-peer or faculty to student feedback about composition and choreography. I now realize that I have taken this assessment experience for granted. I found myself using terminology and aesthetic discourse during class discussions on readings and online multimodal/digital compositions that I would use if I were giving feedback about a dance work. If my colleagues are searching for a metalanguage in order to discuss and assess digital compositions, why not apply the language that already exists for inherently multimodal and interdisciplinary arts such as dance/dance making? What follows are two examples of ways to make connections between the metalanguage of dance composition and interdisciplinary composition in the English classroom. As mentioned earlier, I had been asked to sit on a panel of an informal concert at ACDFA and give feedback about the work presented. This was the perfect opportunity to put my ideas into action as to whether choreographic feedback could speak to a community outside of the dance world. During this feedback session, I decided to record words that my fellow panelists were using to describe what they experienced during each performance, and then share them with my classmates upon my return. There are some words listed that are obviously dance-specific: kinesthetic awareness, retrograde, shape of space and physicality. However, there are a number of words that I believe can easily be navigated into a conversation about composition of all kinds. I asked my classmates to take a look at my compiled list, and pick out any words that they either already use in their classroom for creative assessments, or that they find particularly intriguing as words that might apply to an English composition classroom. Delicacy: I find that the idea of delicacy doesn’t always have to do with the intention of performance, but how light (or heavy) a hand the creator uses while putting together their media. Ambiguity: I believe that ambiguity has the potential for a positive description. The right amount of ambiguity can provide the audience with wiggle-room to make decisions about reason and meaning on their own. Ambiguity can be a powerful device when used appropriately. Entrance/Exit: These two words can be taken very literally for the stage, but when composing digitally, it is very important to be mindful of how to transition between media; a well-placed cut on action, or fade-in/out are important details that can change the look and feel of a project. 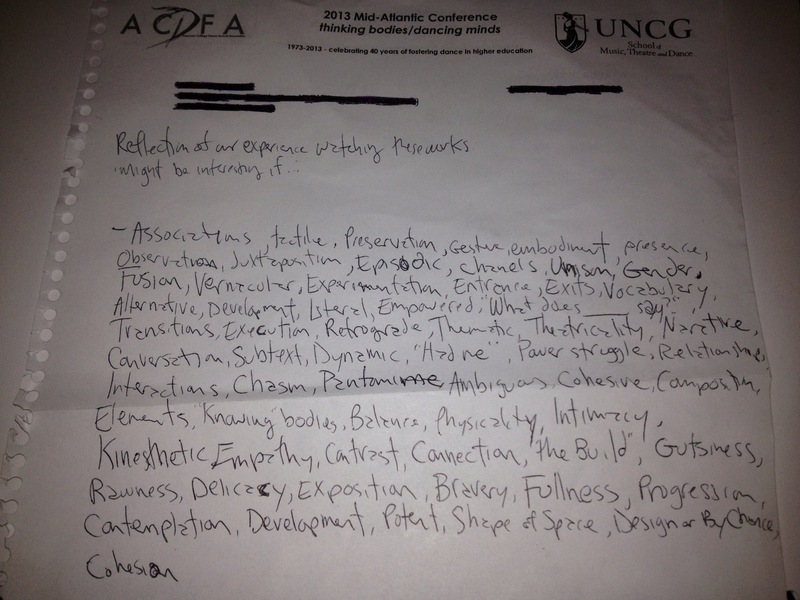 My experience at ACDFA did not warrant graded results of course, but it provided the perfect opportunity to gather a list of words that give an embodied indication about what is seen, heard and felt about a composition. By finding ways to tap into vocabulary from outside mediums of written compositions, a teacher who might be in new territory speaking about non-written work can find ways to articulate themselves to their students. Ironically, I was at the conference to present, with three other University of Michigan instructors, a panel entitled, “Creative Convergences: Integrating the Arts and Technology in the Writing Classroom.” Each of us showed examples of undergraduate work that used multimedia and genre-blending to create compositions that were aesthetically and conceptually sophisticated. The example I showed, an excerpt from Molly Yaple’s four-part video poem, “Love Poems,” consists of a voiceover of Molly reciting her original text in combination with original and open-sourced video footage, music, and sound effects. The result is an integrated, complex, and moving work of art. Like Zell, I have had the feeling, when reading responses to news posts or other public forums on the Internet, that literacy is “under siege.” Yet positioning printed literary works in opposition to web-mediated text ignores the potential of digital compositions to not only contribute to our collective intellectual health but to push at genre boundaries maintained by traditional creative writing programs. Of the nearly 500 presentations listed in the three-day schedule of events, less than a dozen included any mention of digital technology in spite of the significant numbers of digital journals registering their presence in the bookfair. If technology integration is part of the pedagogical focus of most MFA programs, you couldn’t prove it by the roster of presentations at AWP. Like many writers, I have a deep and abiding love for books made of ink and paper. But writers who ignore the potential of digital technology for not only distributing but creating texts risk becoming obsolete in their own time.